Florida is by far America's most popular state in terms of visitors, with something like 60,000,000 visiting every year. They visit to take advantage of the warm tropical weather, miles of beaches, and of course, the many amusements parks! However, Florida is also home to a good deal of history too. Florida was named "La Florida" by the Spanish who arrived in 1513. 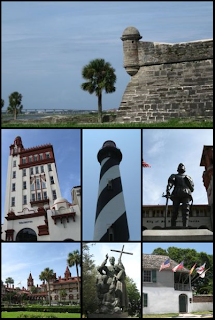 However, it was the French who set up the first city in North America at Fort Caroline (Jacksonville today) in 1564, and the Spanish established their own settlement at San Augustine (Saint Augustine) the following year. So, Florida is home to the first city to be established in the US in Jacksonville, and in Saint Augustine, they have the oldest continuously inhabited city in the US. Jacksonville cant claim the title as the Spanish soon overran Fort Caroline and expelled the French! The Spanish controlled Florida, and their territories extended from the Florida peninsula across the south of what is now the US all the way to the Mississippi. The Spanish, to govern it more easily, split them into East and West Florida. However, as the Spanish moved north, and the British moved south from their territories around Virginia, there was, inevitably, conflict. The Spanish controlled Florida from their arrival, in 1565, to 1763. The Spanish lost Florida to the British after the British victory in the Seven Years War fought in Europe. As part of the treaty, the British returned Cuba which they had seized, in return for control of Florida. During British rule, the border line for West Florida was moved north, effectively taking control of the lower third of what is now Alabama and Mississippi. However, during the Revolutionary War, Florida remained loyal to Britain through the conflict, but the British had to return Florida to Spain as signed in the Treaty of Paris. Spain wanted to keep the new, expanded boundaries, but the US got its wish, and the boundaries where returned back to the 31st parallel. During Spain's second period in rule, there was little Spanish control. Americans moved south and settled in Florida, and many British remained. Focused in West Florida. 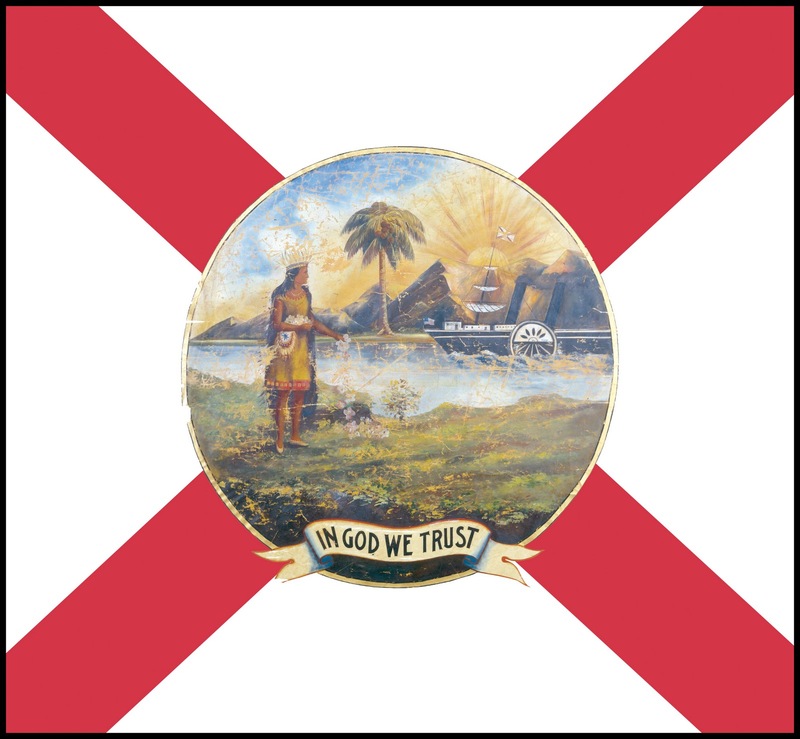 Things came to a head when, in 1810, a rebellion took place in West Florida which established a new Republic, and unveiled its first, and only, flag. The Bonnie Blue flag. A single white star on a blue field. 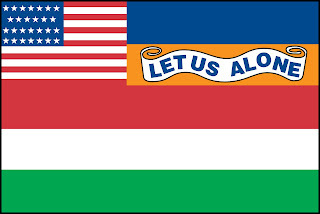 The Republic of West Florida lasted all of 90 days, until it was annexed by the US. 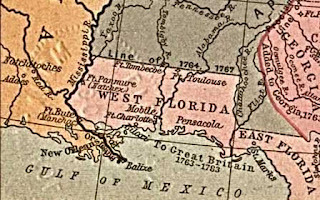 President James Madison issued a proclamation which saw the US declare West Florida as under the US' control because it was part of the Louisiana Purchase. West Florida initially refused to back down, but with American forces moving down, quickly backed down. 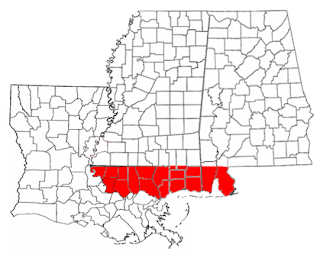 The lands that made up West Florida was soon carved up and incorporated into the Territory of New Orleans, and later, absorbed into the lands making up Alabama, Mississippi, and Georgia. East Florida became something of a haven for people who wanted to attack the US, given how little control Spain had over it. The US sent more and more troops into Florida in an effort to stop raids by the Native Americans, until it reached the point when the US effectively controlled the territory. 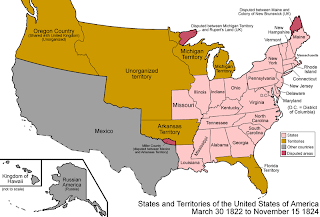 So, in 1821, the US gave up its claim on Texas through the Adams-Onis Treaty, in return for Florida. The US wanted to control Florida simply to protect its southern territories. Some parts of West Florida where returned, and merged with East Florida to form the Territory of Florida. 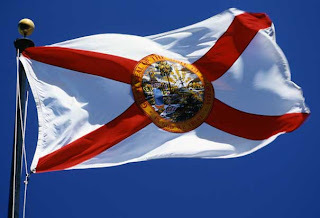 Florida finally achieved statehood, being admitted into the Union as the 27th state in 1845. The citizens of Tallahassee presented the first governor of the State, William D. Moseley, with a design for a state flag. This consisted of the new 27 star US flag placed in the upper hoist, and the rest of the flag consisting of 5 stripes of blue, orange, red, white, and green. A new motto placed in a scroll on the orange. 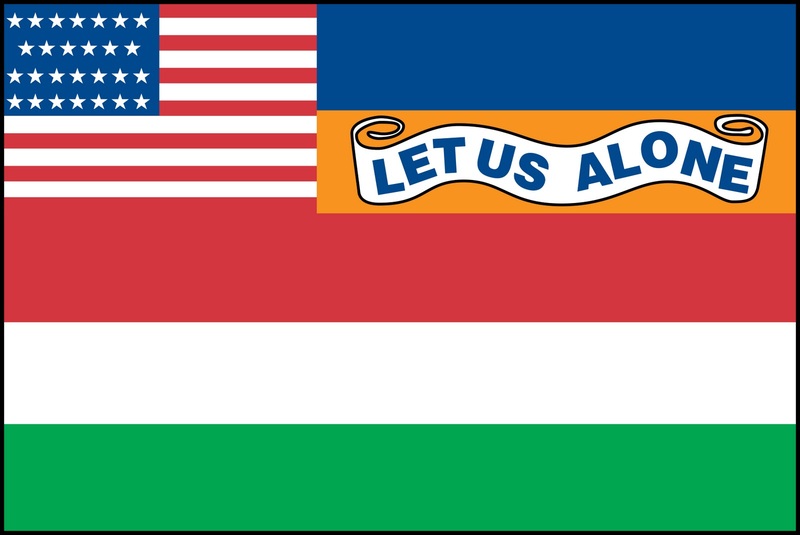 However, the motto of "Let Us Alone" proved controversial, so the flag was never used. 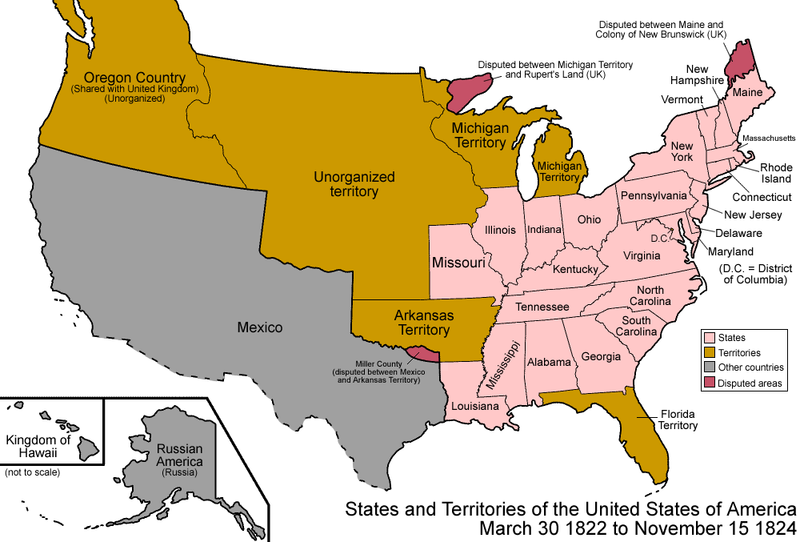 With President Lincolns election in 1860, Florida joined several other southern states in seceding from the Union. 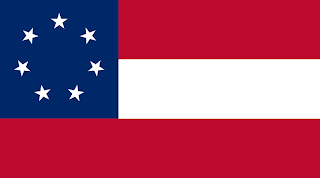 And after a month as an independent Republic, became one of the founding states of the new Confederate States of America. 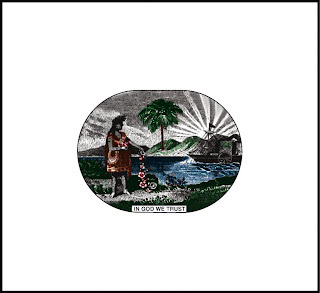 However, during its time as an independent Republic, a secession flag flew over Florida. One such flag was a white banner (OK, this one is grey!) split in half. On the hoist side, a large blue disc. Within which are 3 large red edged blue stars, with a further 12 blue stars around the edge. 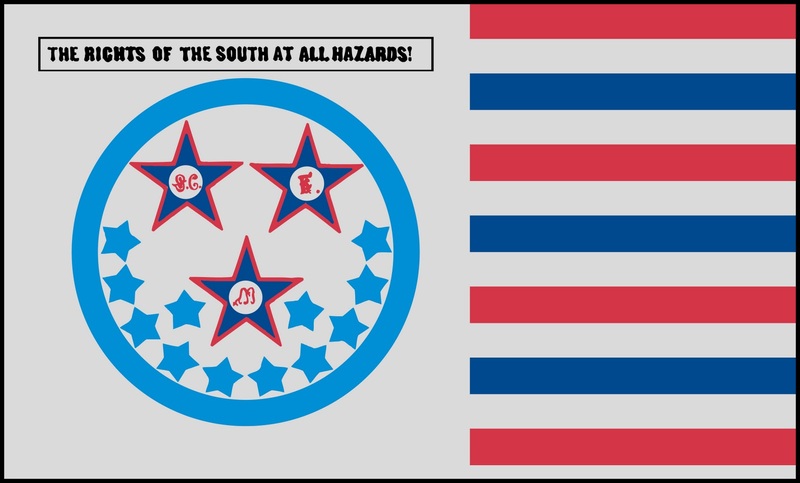 Above the disc ir reads "The Rights of the South at all hazards!" The fly side of the flag is divided amongst 13 horizontal stripes, alternating red, white, blue, white, and so on. Another provisional flag that was used prior to the formation of the Confederacy saw Florida adopt the old naval flag from the Republic of Texas. This saw a return of the Lone Star, but this time, placing it on the upper hoist, and the rest of the flag made up of the 13 red and white stripes taken from the US flag. 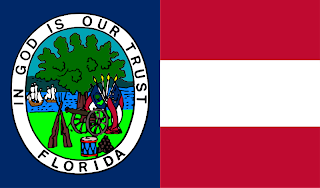 A new state flag was adopted once Florida became part of the new Confederacy. 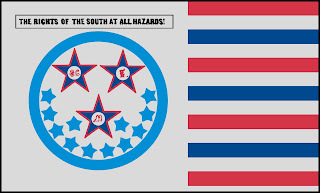 This one copied the use of the3 horizontal stripes taken from the CSA's Stars and Bars flag. 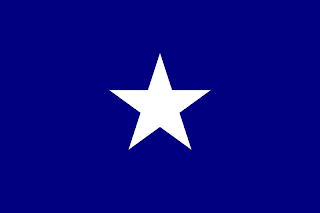 however, unlike the Stars and Bars, the blue was extended all the way down the hoist of the flag, and the new seal placed on the blue stripe. 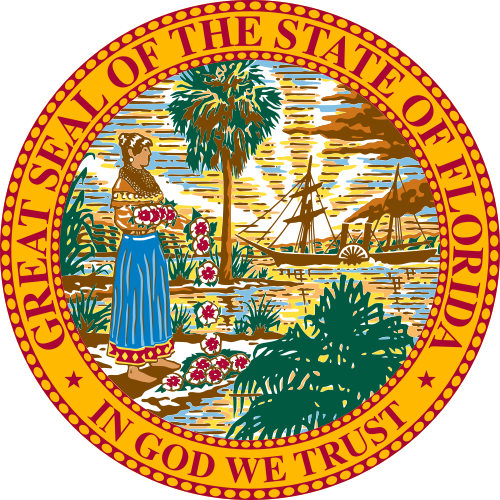 The seal was oval shaped, and featured the text "In God is our trust" and "Florida." In the seal is a tree, with sailing ships in the background. In the foreground is a field cannon with drums, rifles, and cannon balls. Displayed over the cannon are the Confederacy's "Stars and Bars" and Florida's new flag. The CSA did not last long, losing the Civil War. 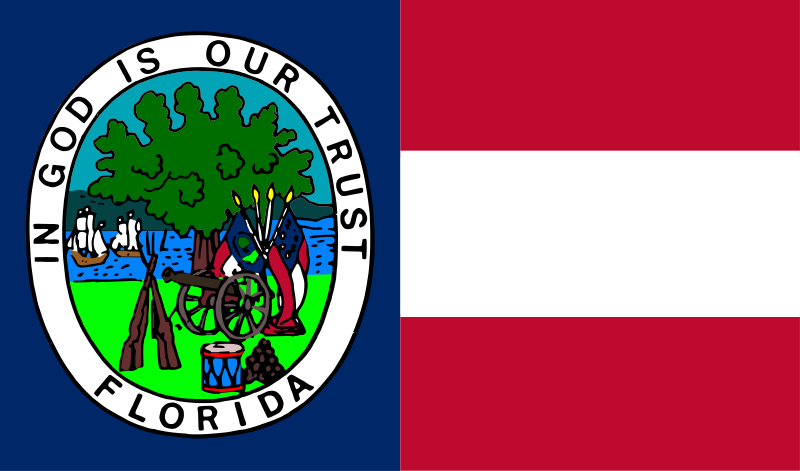 Florida was formally readmitted to the Union in 1868, and instituted a new state flag. 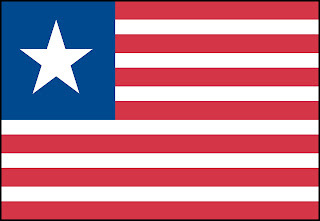 This flag, however, was very simple. A plain white flag with the state seal placed in the centre. The seal consisted of a native Indian with a garland of flowers (La Florida), a paddle steamer, and rays of the sun rising over the hills in the background. The new state motto of "In God we trust" placed at the bottom. However, one discrepancy is that the steamer displays a white flag with a red saltire. The next change happened in 1900, when a red saltire was added to the flag. It was felt that when the flag was flying, and there was no wind, you could not clearly see the state seal, so the flag looked like a flag of surrender. The flag also had an updated version of the state seal. The current flag was adopted in 1985, when the state lengthened the flag, and introduced a graphically improved seal. 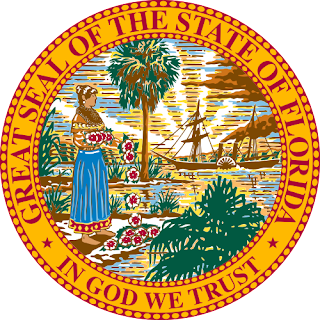 The seal itself features the words "Great Seal of the State of Florida" and the motto "In God we trust" round the edge. The image itself features a Seminole Indian woman, with Hibiscus flowers, and 2 Sable palms. In the background a steamboat sails, with a sun breaking. The rays of which stretch into the sky. It is likely that a red saltire was chosen in honour of the Cross of Burgundy, which is the flag that the Spanish used when they established Saint Augustine, America's oldest city. 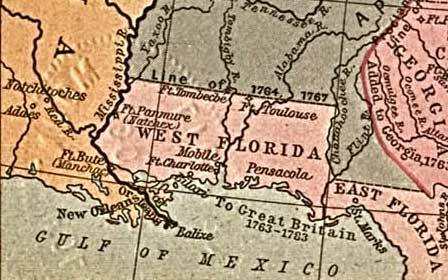 It was England who split up Florida into east and west, during their rule of the Floridas from 1763 to 1783.